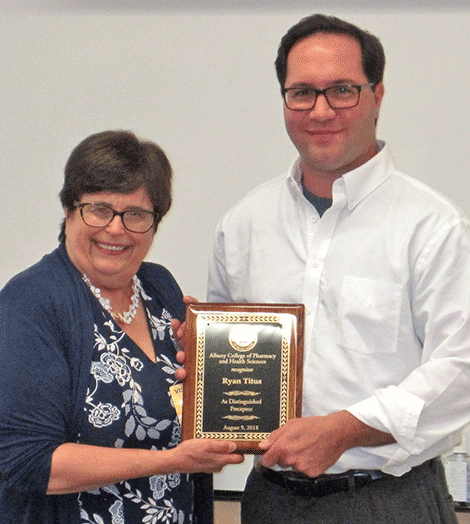 Sandra Rosa, left, presents the Preceptor of Distinction Award to SLHS’s Oncology and Ambulatory Pharmacist Ryan Titus. POTSDAM – A St. Lawrence Health System pharmacist and teacher has been awarded Preceptor of Distinction from Albany College of Pharmacy and Health Sciences (ACPHS). Prof. Ryan Titus, an Oncology and Ambulatory Pharmacist with SLHS, has a practice at the Center for Cancer Care at Canton-Potsdam Hospital and at the Helen Snell Cheel Medical Center on Lawrence Avenue. Titus is also an adjunct assistant professor and course coordinator of pharmacotherapeutics at Clarkson University, adjunct experiential faculty of ACPHS, and core preceptor, or instructor, with SLHS’s post-graduate pharmacist residency program. “Ryan has been a preceptor for many years and continually receives exceptional reviews from the doctor of pharmacy students,” ACPHS Assistant Dean of Pharmacy Practice Experiences Sandra Rosa said. “Preceptors lay the clinical foundation required for treating the patients of today and of the future. Ryan’s intelligence, experience, patience, and willingness to teach the medical professions of tomorrow is truly beautiful. We are honored to have Dr. Titus as a preceptor for our university and are pleased to present him with the Distinguished Preceptor Award,” Rosa said. Titus received his doctor of pharmacy (PharmD) degree from ACPHS, teaching certification from Johns Hopkins University, and was awarded Board Certified Pharmacotherapy Specialist (BCPS) and Oncology Pharmacist (BCOP) status by the Board of Pharmacy Specialties (BPS).